LONG BEACH — Dredging of the main channel and a key turning basin for ships in the Port of Long Beach has been completed, marking a major milestone in an ongoing $40 million project by the port and the U.S. Army Corps of Engineers to improve navigation and the environment in the harbor. The project has provided a minimum depth of 76 feet from 2 miles outside the harbor entrance at Queens Gate to the Middle Harbor and East Basin, serving the crude oil terminal on Pier T, improving access for oil tankers. The deeper, wider channel and basin will provide additional, safer access to Long Beach Harbor for the world’s largest container ships. “This is a critical project for the Port of Long Beach,” said Doug Thiessen, Port of Long Beach managing director of engineering. “It greatly enhances the port’s capabilities and navigational safety. “We’ve been very fortunate to develop a strong and successful working partnership with the Army Corps of Engineers that has resulted in some major improvements to this harbor,” Thiessen added. The 17-month dredging project has generated about 180 jobs. 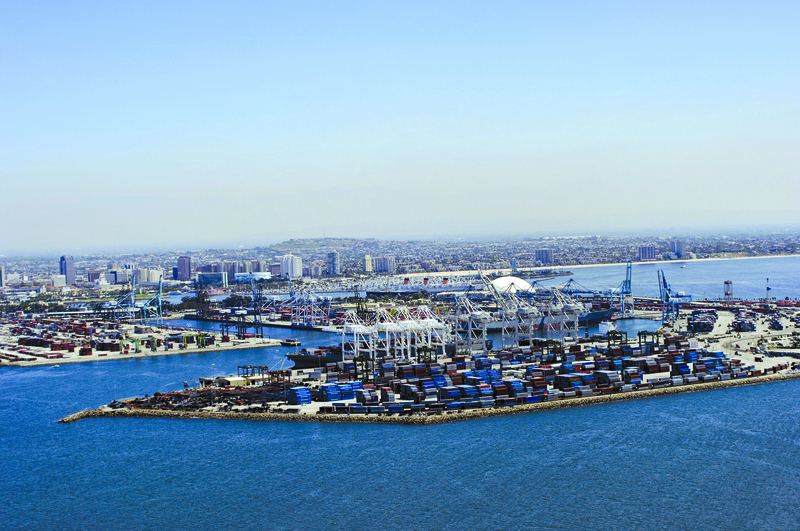 About $35 million of the project’s cost was provided by the Port of Long Beach, with $2.6 million from the Corps of Engineers and $2.4 million in federal economic stimulus funds. The Corps has also been providing project construction management. In addition to the main channel deepening, the project has included dredging to improve navigation at the Catalina Express ferry landing in downtown Long Beach and the removal and environmentally safe containment of 660,000 cubic yards of decades-old contaminated sediment in the harbor, left over from the former Navy station in Long Beach. A total of 1.5 million cubic yards of dredged sediment is being reused within the port to create needed new land area, as part of the $750 million Middle Harbor Redevelopment project site. The additional land at Pier G is providing for an expanded on-dock rail yard, which will reduce truck trips and emissions. With completion of the dredging of the main channel and Middle Harbor turning basin, fully laden tankers can now come directly to berth without first stopping offshore to unload part of their cargo, so vessel security and environmental safety have been enhanced. Before, the turning basin was not deep enough to allow these tankers to enter the port fully loaded. The dredging was performed by Manson Construction Co. The majority of the dredge work was done hydraulically, powered by environmentally friendly onshore electricity instead of diesel engines.